This new-build house for a couple of artists sits on an irregularly shaped plot in South London, mediating between a residential avenue and quieter, single-lane road to the rear. We wanted to reflect the character of Peckham: the sense of faded smartness that permeates through its largely Victorian and Georgian housing stock, combined with a high proportion of resident artists and other creatives. 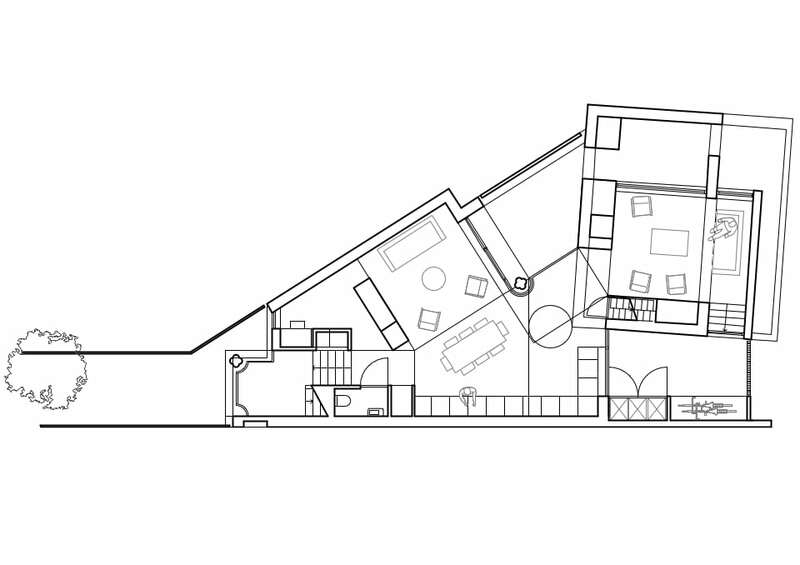 As such, the new dwelling is conceived as a house and workshop: domestic and industrial, decorated and functional. Found fragments of local buildings are oversized and inverted, such as the delicate quatrefoils inset into facades, which are manifested as cast concrete columns; part of a continuing theme in our work where buildings sit quietly within their surroundings, but on closer inspection subvert recognisable elements to create something simultaneously familiar and contemporary. The front of the house relates to the principal avenue, adopting the building line of its northern neighbour and remaining subservient to the more historic building to the south. 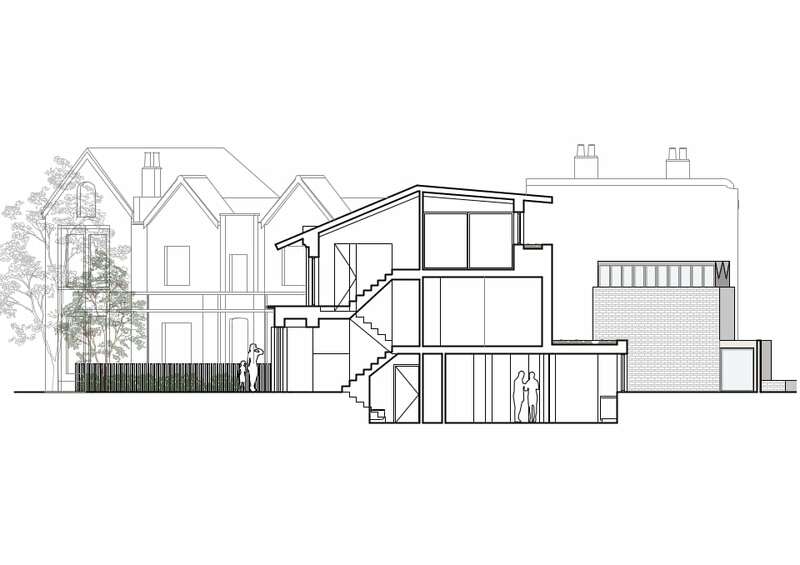 The rear of the house is modelled to align with the rear facade of both adjacent buildings, with a further ‘pavilion’ / ‘workshop’ up to the pavement line, which houses the sitting room, with a painting studio in the butterfly roof above. 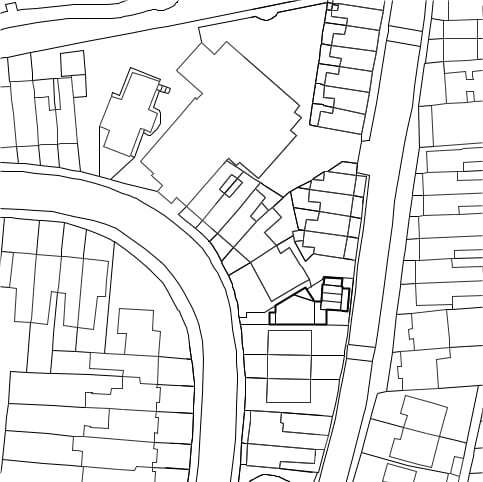 This small volume, which reads as single storey from the street, acts to mediate between gardens with full-height fences and full-depth, back-of-pavement extensions to the south, and a row of Victorian houses with small front gardens to the north, while reflecting the less formal, more industrial nature of the back road. 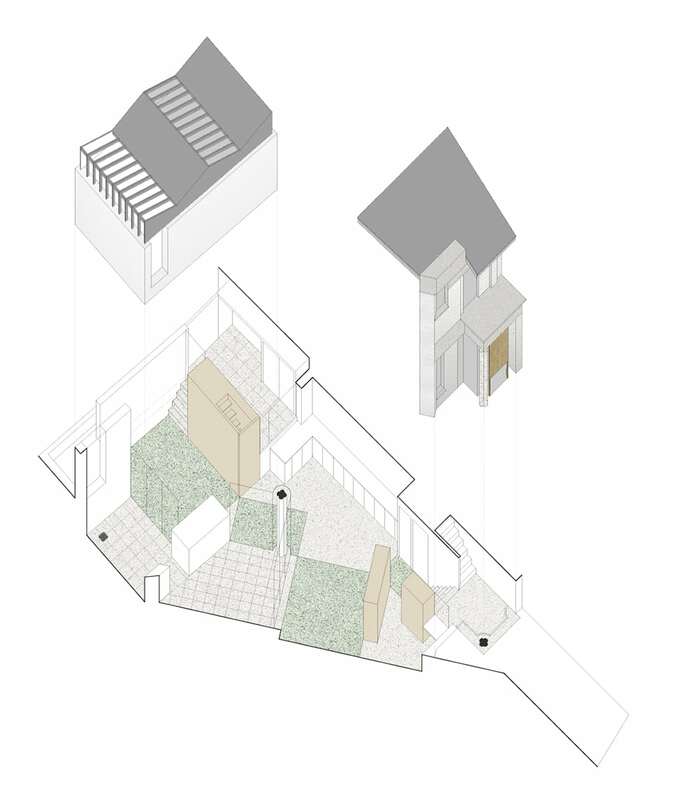 A stepped ground floor with intermediate courtyards (both open and covered) allows not only for natural light to filter throughout the deep plan, but also allows the house to be articulated in a series of different masses as it responds to a range of quite different contextual elements. Local buildings vary from Victorian to more recent infill, but the proposal picks up on several interesting details noticeable in both the avenue onto which it fronts and surrounding streets: stucco dressings (increasingly ornate in later buildings), roofs of slate with deep overhangs, strongly ordered forms with a regular, rhythmic, positioning of windows and openings, and repetitiveness relieved by the introduction of string courses at floor and roof levels, as well as moulded window surrounds and pediments to give elements prominence and create relief in the facade. The main material of slurried pale London stock bricks references the smooth, pale masonry construction of several neighbouring sandstone Victorian buildings, while the white-painted pavilion with expressed butterfly roof speaks more to the small rendered and painted terrace which it abuts. Concrete bands at first floor and roof level give accent and relief to the facades. Single quatrefoil columns to the entrance porch and within the main courtyard (and adjacent curved glazing) allude quietly to a more explicit level of ornamentation. As a whole the house can be said to be quiet and respectful to its context, while being formally playful. 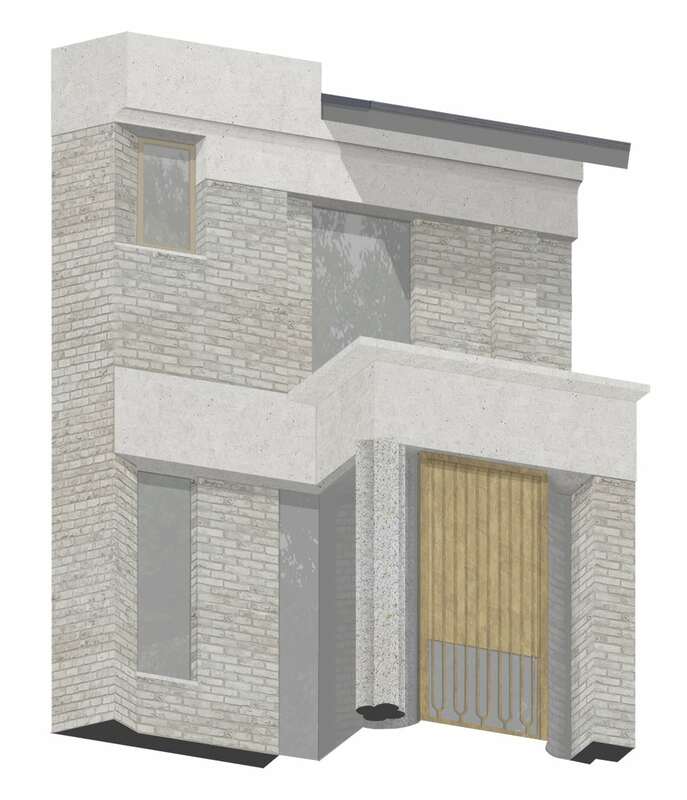 The scheme recently received planning permission and is due to start on site later in 2018.